WESTON, Fla., Dec. 2, 2016 - Designed with today's modern traveler in mind, Courtyard Fort Lauderdale Weston's new accommodations redefine the way guests work, play and relax on the road. Whether traveling to Florida on business or pleasure, visitors will have the opportunity to bask in a completely new level of convenience and comfort thanks to the recent redesign of the Courtyard's guest rooms and suites. Renovations were completed on Nov. 30, 2016 and features all new furniture, paint, carpet and décor. The upgraded accommodations offer a stylish escape for guests to maintain their everyday routines. Beds at the hotel are more comfortable, ideal for relaxing after a busy day of working hard or playing hard. They also feature crisp linens and mountains of plush pillows that expertly match the new paint and décor surrounding the walls of each room. Unique to many hotels in the area, Courtyard Fort Lauderdale Weston's accommodations feature furniture that strategically uses space, ensuring that all guests have more room to stay as relaxed or productive as they please. The furniture is also designed to help visitors easily access power outlets, allowing multiple devices to charge with ease. Family caravans or friendly getaways can find a successful night's stay in these modernized rooms. The renovated accommodations at the hotel were also designed for the business-minded traveler. The new, spacious desks come equipped with modern lighting in strategic locations and easy access plug-in panels, making working from the hotel a breeze. The new ergonomic chairs provide maximum comfort while guests complete tasks or take a break to watch TV. When not making themselves at home in the contemporary-inspired rooms, travelers will love exploring the hotel's prime location within moments of popular restaurants and local destinations. Spend a day holiday shopping at Weston Town Center, Westfield Broward Mall or Sawgrass Mills Mall, where a variety of popular stores reside, or show some team spirit at BB&T Center, home of the Florida Panthers and a bevy of concerts. Everglades Holiday Park and Broward Center for the Performing Arts are also nearby, perfect for tourists of all ages and interests. Guests looking to escape the cold front this season can opt in on the exclusive Florida Winter Escape package offered at Courtyard Fort Lauderdale Weston. Receive up to 15% off regular rates when you book two or more nights. Book with code SUM between December 5 – 31 for stays between December 7 and March 31. Blackout dates include Christmas and New Year's. 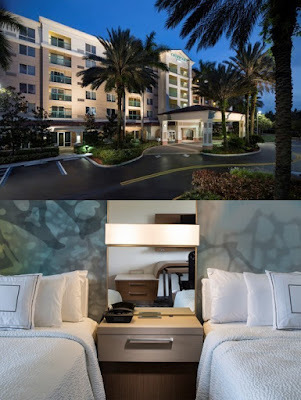 To reserve a room at Courtyard Fort Lauderdale Weston, visit www.westoncourtyard.com or call 1-954-343-2225. About Courtyard Fort Lauderdale Weston Courtyard Fort Lauderdale Weston is at 2000 N. Commerce Parkway Fort Lauderdale, Florida and is just off of Interstate-75. The hotel is located near BB&T Center, Cleveland Clinic Florida and Sawgrass Mills Mall. Within the six floors of the hotel are 171 guest rooms, 3 suites, a fitness center, an outdoor pool with a whirlpool and The Bistro. 5 meeting rooms with a total of 1,969 square feet are also featured at the hotel. For information, visit www.westoncourtyard.com or call 1-954-343-2225, and like Courtyard Fort Lauderdale Weston on Facebook.